make it as well our Lord's as our Lady's day." Son, and you shall call his name Jesus. Alleluia, rejoice, rejoice, O Mary. Branches sprout leaves and the grasses are springing. Chosen as mother by the King of Kings. Descended from Jesse, of kingly kin. To save us from sin, who would else be forlorn. Be with you!' was the angel Gabriel's word. Mary considered and pondered in thought. She said to the angel, 'How could such thing be? And still virgin yet when her Babe she bore. Mary you alone who was deemed worthy to receive the fullness of the Spirit did bear in your womb Him Who is the fountain of this gift. Mary you who are the embodiments of beauty and loveliness did become a wondrous tabernacle for the Saviour of the World. O flower of the field who brought forth the lily of the valley; O holy Mother, gracious Lady, help us to live in the light and truth of your Son. Be ever with us now, and at the hour of our death. Amen. Heavenly Queen of feature fair! To alight within you there. And calmly said, 'So let it be!" Steadfast was your mind and true. Lady, show your grace to me! 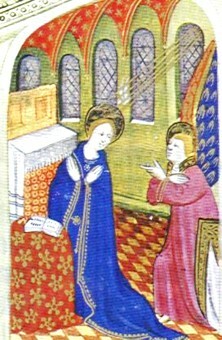 In the Eastern Church, unlike in the Western Church where Mary is often depicted kneeling in prayer, she is depicted standing or sitting when the angel Gabriel comes with his divine message. 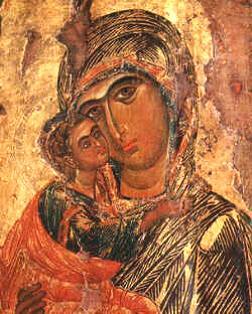 "O Theotokos, Virgin Mary, it is indeed a dread and ineffable mystery, what has been done in you. For you indeed gave birth to the Word, who is the cause of all things, and Who is the cause of all things, and who was incarnated by the Holy Spirit, beyond any cause or reason." But Mary, although she is the mother of Jesus Christ, is also in Christian tradition the figure of the Church, the People of God. In the Orthodox Church she is never separated from the Church she signifies. Her vocation is therefore also the vocation of the Church, which is called to bring Christ into the world. called Nazareth, to bring to the Virgin the joyful news. He came to her and said: Greetings, vessel holding the nature nothing can contain! 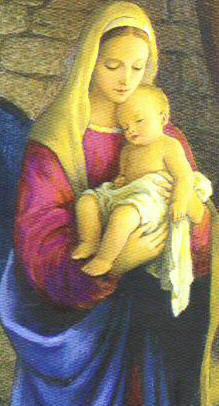 For your womb, blessed one, has embraced him whom the heavens could not contain. the whole world's rejoicing our race's great joy. And loving mercy for mankind. a womb embraces the infinite; the timeless is within time. 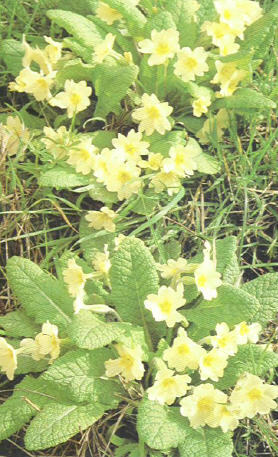 Marvellous is his conception, without seed! Beyond telling his self-emptying! How great the mystery! Greetings, favoured one! The Lord is with you, in his abundant mercy. Today is joy's good news, the Virgin's festival. from earliest sadness is Eve set free. our human clay, is made God's own temple. how he is conceived cannot be told. the Father consents from heaven, common purpose brings about the covenant. has taken our human nature, exalting it to himself. Husbandless am I: how shall I bear a son? Who has seen seedless birth? God's Word to earth has now come down. that as God he might save from error our human race. is revealed to the world. He takes the form of a slave and becomes human, not parted from God. He creates Adam anew in the womb of her who without seed conceived him. Today all creation rejoices, for the angel cries: Greetings! The Creator, pitying his creation and stooping in his compassion, makes haste to dwell in a Maiden's womb, the womb of God's own child. Greetings, whom God has favoured! Our God is now with you. Have no fear of me, the king's great commander. For you have found the grace which your ancestress Eve lost of old. You will conceive and give birth to him who is of one being with the Father. 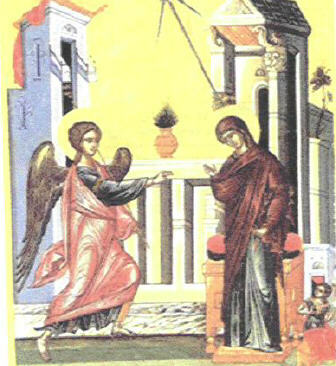 From heaven was sent the archangel Gabriel, to announce to the Virgin her conceiving. How can he be born of a Virgin who, beyond understanding, dwells on high? How can he, whose throne is heaven and whose footstool earth, be embraced in a woman's womb? has consented at a single word to become flesh through her. He who is present is the word of God. So why do I stand still and not say to the maiden: Greetings, favoured one! the Lord is with you. Greetings, pure Virgin! Greetings unmarried Bride! Greetings, Life's mother! Today is our salvation's beginning, the eternal mystery's revealing. God's Son becomes the Virgin's; Gabriel brings good news of grace. R. Mary, the dawn, pray for us. R. Mary, the root, pray for us. R. Mary, the wheat, pray for us. R. Mary, the mirror, pray for us. 0 God, in the incarnation of the Word, you have wrought a marvellous exchange: as he humbled himself to share in our humanity, so did he enable us to have a share in his divinity. Transform us, 0 God, according to your word, through the same Christ our Lord. Amen. We hail you, O mysterious and Holy Trinity who has gathered us together in council in this church of Holy Mary, the Godbearer. We hail you, Mary, the Godbearer, sacred treasure of all the universe, the star which never sets, the crown of virginity, the sceptre of true law, a temple which cannot be destroyed, the dwelling place of one who cannot be contained. O Mother and Virgin, we hail you for the sake of the one whom the holy Gospels call 'blessed', the one who 'comes in the name of the Lord'. We hail you Mary, for in your virginal womb you held the one whom the heavens themselves cannot contain, one through whom the Trinity is glorified and worshipped throughout the world; through whom the heavens exult; through whom angels and archangels rejoice; through whom demons are put to flight; through whom the tempter was thrown out of heaven; through whom fallen creation is raised up to the heavens; through whom the whole world, held captive by idolatry, has now come to know the truth; through whom holy baptism is given to those who believe, anointing them with the 'oil of gladness'; through whom churches have been founded throughout the world; through whom the nations have been converted. What more can I say? It is through you, Mary, that the light of the onlybegotten Son of God has shone upon those 'who dwell in darkness and the shadow of death'. It is through you that prophets have spoken of the future, that the apostles have preached salvation to the nations, that the dead have been raised, that monarchs are reigning in the name of the Trinity. Is there a single person who can sufficiently set forth the praises of Mary? She is both Mother and Virgin. What a wondrous thing! In fact it is so wonderful that I am overwhelmed by it. Has anyone ever heard of a builder who was stopped from dwelling in the temple he himself had built? Has anyone the right to speak ill of the one who bestowed upon his own servant the title of 'mother'? This is why today everyone is rejoicing. Today, therefore, may we the Church worship and adore the unity, may we worship and honour the undivided Trinity, by singing the praises of Mary ever Virgin, and the praises of her Son and immaculate Spouse, to whom be glory for ever and ever. Mary's vocation belongs to every Christian, as well as to the Christian community as a whole. Through our willing obedience to the word of God us, the Holy Spirit dwells within us, in the depths of our being and there forms Christ in us. We bring him forth in our world, as we learn to let his mind inform ours, and as we put into practice the love of God, which was embodied in him, and shed abroad in human hearts by the Holy Spirit. The Annunciation reminds us too that we too are overshadowed by the power of the Most High, that Christ is to be formed in us, and that we are to be the means by whom the love of God enters the worlds, to extend in its life his reconciling and renewing power. 6. Our Lady of Sorrows.